Yes, it’s exactly what it says, Freedom Classes. Once you’ve packed the children off to school, why not take some time for yourself? Get a sense of freedom and meet some other mums. Tennis is great fun and you can get fit at the same time. It exercises your whole body and 1 hour of tennis burns between 400-900 calories. Freedom classes combine learning and playing tennis with other exercises. Done in a group, with just women, you can be sure it will be fun and not intimidating. 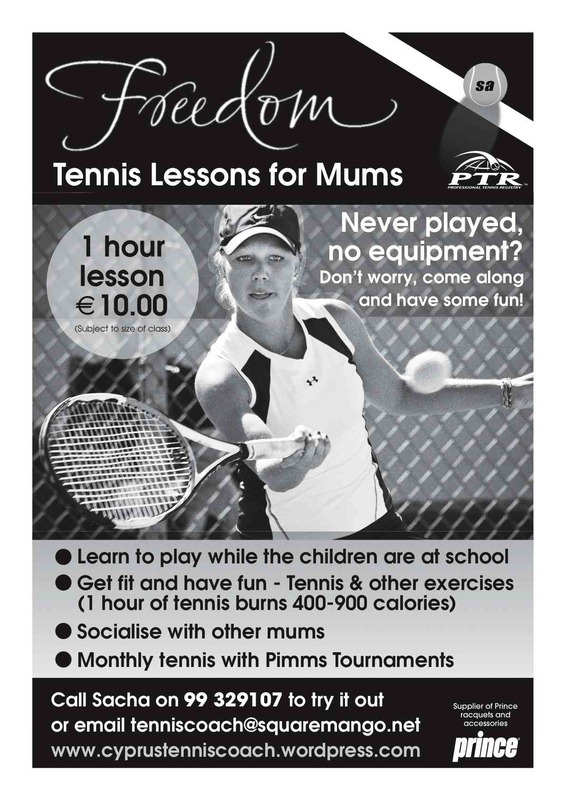 The teaching style will encourage a social atmosphere and this will be helped by the regular “Tennis with Pimms” tournaments. The classes are for beginners to advanced players and you don’t need to be fit to start. The intensity of the classes will built up slowly, tailored to suit each group. If you have a racquet, bring it along. If not, don’t worry. Just wear trainers and clothes you are comfortable doing sports in. This entry was posted in Cyprus Tennis Coaching, News and tagged Aphrodite Hills, Baghdatis, Cyprus, Cyprus Tennis, Cyprus Tennis Coach, Cyprus Tennis Federation, Fitness, Learning Tennis, Play Tennis in Cyprus, Tennis, Tennis Academies in Cyprus, Tennis Academy, Tennis Centre, Tennis Club, Tennis Clubs in Cyprus, Tennis Clubs in Limassol, Tennis Clubs in Paphos, Tennis Coaching, Tennis Courses, Tennis Equipment, Tennis Fitness, Tennis Holiday, Tennis in Cyprus, Tennis in Limassol, Tennis in Pafos, Tennis in Paphos, Tennis Lessons Cyprus, Tennis Lessons in Cyprus, Tennis School, Tennis Tournaments in Cyprus, Womens Tennis by Paphos Tennis Coach. Bookmark the permalink.